When we talk to marketers regarding the challenges they are facing, lead generation seems to come up again and again. It makes sense. In many organizations, the line between marketing and sales has slowly been blurring over the years. Marketers are under pressure to not just drive traffic, but quality traffic that they can hand off to sales. 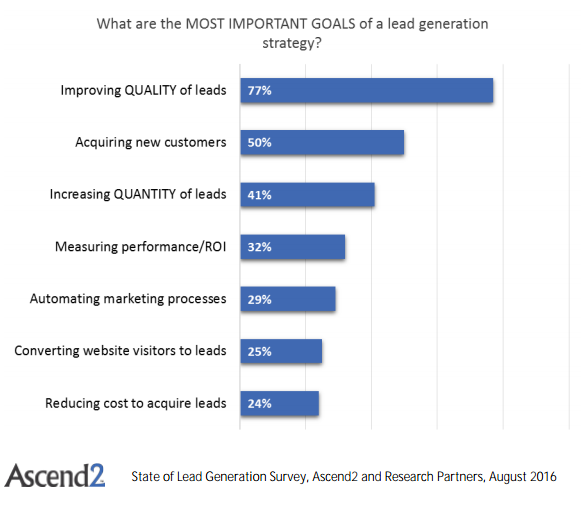 According to a recent study by Ascend2, 77% of marketers cite improving the quality of leads as the most important objective of a lead generation strategy. That's why Intel has become a key tool for not only our customers, but our own marketing strategy as well. Intel enables marketers to turn anonymous website traffic into full company profiles so you can alert sales when a key account visits your site, allow marketing to better identify successful campaigns, and create extremely targeted ads to boost conversion. With our latest update, we've made it even easier to identify the hot leads with a new heat meter based on their recent activity. Then you can click through to see all the company details including a breakdown of recent visits. This data is of course available in all the integrations we support (Google Analytics, Mixpanel, etc. ), but a number of customers have asked for a simple version they could quickly look at. Let us know what you think! We're always looking for feedback on how we can make our products more useful. If you're interested in trying it out, you can try it free for 14 days. It takes minutes to get setup and there's no code required.